Solid State Instruments, the leader in pulse isolation relay products brings you a new solution to the common problem of getting pulses from a remote pad-mounted or pole mounted meter across parking lots, fields, roads, railroad tracks or anywhere where it is difficult to get a KYZ pulse from the meter. SSI is proud to introduce the PRL-1200 Wireless Pulse Link, our third-generation wireless pulse link system. The PRL-1200 adds features to the original PRL-900’s features, and provides additional reliability for tough, demanding wireless pulse applications. PRL-1200 is a cost-saving and time-saving solution that eliminates the need of trenching or running overhead wires. 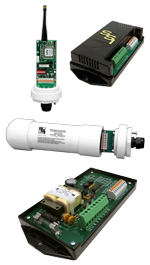 The PRL-1200 Wireless Pulse Link system consists of one PRT-1200 Transmitter and one PRR-1200 Receiver. The system operates in the 900MHz band, and is FCC certified, thus allowing unlicensed operation by the user. The PRL-1200 will transmit pulses up to 5,000 to feet in a line-of-sight (LOS) configuration. Distances vary with the terrain, obstacles and greater elevation above the ground.